Working at the interface between public and private interest is part of E. D. Hovee’s DNA. Prior to forming a consulting firm, principal Eric Hovee managed public-private initiatives for economic development on behalf of two city agencies – first in Portland OR, then Vancouver WA. One of the roles that the consulting firm has taken on has been to conduct independent feasibility reviews of development projects and their feasibility – for public sector clients. This blog focuses on major public and private developments in the two leading cities of the Pacific Northwest cities – Portland and Seattle – together with resulting observations and lessons learned. In Portland, E. D. Hovee was in at the early conception and then gestation of two public-private redevelopment initiatives that have reshaped and revitalized the Central City – as early forerunners of the move back to the city now reaching across the U.S. Portland’s Pearl District extended downtown to the north, the South Waterfront (SoWa) district expanded the Central City to the south. Pearl District: The firm’s work in what is now known as the Pearl District started in 1992 with a market/feasibility review – leading to a target of 5,000 new housing units with mixed-use development in what was a declining industrial/warehouse area. And all this at a time when there was virtually no new housing development occurring in the greater Central City area. Four years later, the City of Portland was presented with its first major redevelopment opportunity – a 41 acre former Burlington Northern railroad yard that had been acquired by private investors. The new owners were set to begin development on about half of the acreage subject to City infrastructure investment – re-introducing the street grid and funding of a new streetcar line to connect the Pearl with downtown. A moderate density development of about 40 units per acre appeared to be financially feasible given then-current market conditions – even in the absence of major public infrastructure investment. Getting to the City’s density objective of 80-100 units per acre appeared more challenging, most likely not feasible without public investment. Based on sensitivity analysis involving five different market and public incentive scenarios, the higher density options appeared to be feasible if accompanied by a combination of incentives including street infrastructure, public funding of a Central City streetcar, below market rate financing for 25% of units as affordable, and reduction of residential construction and soft costs. On paper, these measures supported a pro forma with a rate of return sufficient to attract private investment capital and also provide a healthy return on the public investment. Development proceeded, exceeding both public and private expectations. Portland’s first major mixed-use area captured much more of the market at higher increases in rents and values than anyone thought possible. And the public sector then further raised the ante – most notably with added commitments for park and open space as part of the infrastructure package. The Pearl (pictured to the left) has woven together adaptive reuse and renovation of older industrial structures layered in with new higher density residential and mixed use construction. SoWa (to the right) has taken urban density to new heights. South Waterfront: Planning for Portland’s South Waterfront began about the time that Pearl District investments were beginning to materialize on the ground. In 1998, E. D. Hovee completed a market and development capacity analysis for this new urban district. Five years later, in 2003 the firm conducted and independent feasibility review for the City’s development commission to assess the feasibility of developing high-rise apartments just south of Portland’s downtown. 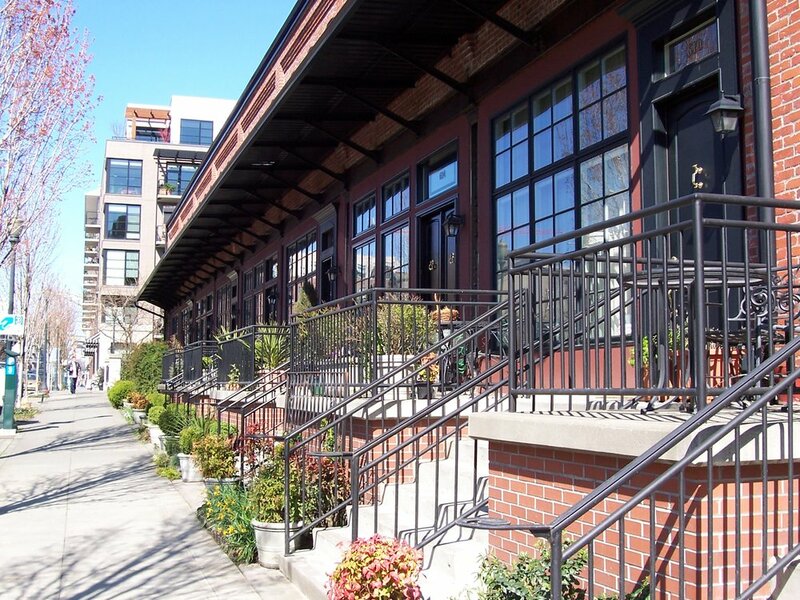 The condo market had been proven in the Pearl District – though SoWa units were projected to come in at yet higher costs – requiring top of market sales pricing. The condo market was also noted as potentially vulnerable to an economic downturn. The City of Portland was planning major investments in supportive street and utility improvements, riverfront public space, streetcar extension and an aerial tram to the Oregon Health & Science University (OHSU) as the city’s largest employer – funded in large part through tax increment financing (TIF). From the City’s perspective, the major risk identified by E. D. Hovee would be a developer slow down or default – best mitigated by conservative tax increment projections and with phasing of public improvements in synch with development activity and resulting TIF cash flow. With a development agreement in hand, the developer began initial phase investments in facilities for OHSU and riverfront condos. The condo market came to an abrupt halt with the 2007 advent of the Great Recession. As in other major metro areas, unit prices plummeted. With post-2010 economic recovery, development activity started back slowly then accelerated – this time led by market rate and affordable apartment units – with supportable rents at new higher levels not previously experienced. In addition to the two Portland master plan projects referenced, E. D. Hovee has conducted numerous additional independent feasibility reviews for a range of development projects both in and outside the Pacific Northwest. But I now skip to two more recent publicly owned Seattle facilities for which feasibility reviews have been completed for the Washington State Department of Commerce in 2018 – expansion of the Washington State Convention Center (WSCC) and a new lease agreement for Safeco Field (now T-Mobile Park) with the Seattle Mariners major league baseball team. WSCC Expansion: The Washington State Convention Public Facilities District is now underway with an approximate $1.7 billion expansion of the largest convention center in the Pacific Northwest. When completed in 2021, the nearly 1.5 million square foot facility will add 434,000 square feet of new event space – more than doubling the event capacity of the existing WSCC convention facility situated one-half block away. Base case revenues as projected by WSCC and advisors appear to be more than adequate to cover bonded debt repayment to 2058. As part of the independent review, E. D. Hovee also prepared a stress test scenario to address the question: What might be the financial implications if a sudden and severe downturn similar to the 2007-09 Great Recession and ensuing 2008-10 lodging tax downturn were to be re-experienced? However, even with what might be perceived as unlikely but clearly adverse debt repayment and operating scenarios, there are multiple financial and operating options that could be considered as possible WSCC mitigation measures. In effect, available financial and operating measures should enable the facility and the public facilities district to weather any reasonably conceivable economic storm. The Washington State Convention Center Addition (pictured to the left as designed by LMN) will effectively double the combined event capacity of this new $1.7 billion investment - planned for opening in 2017. 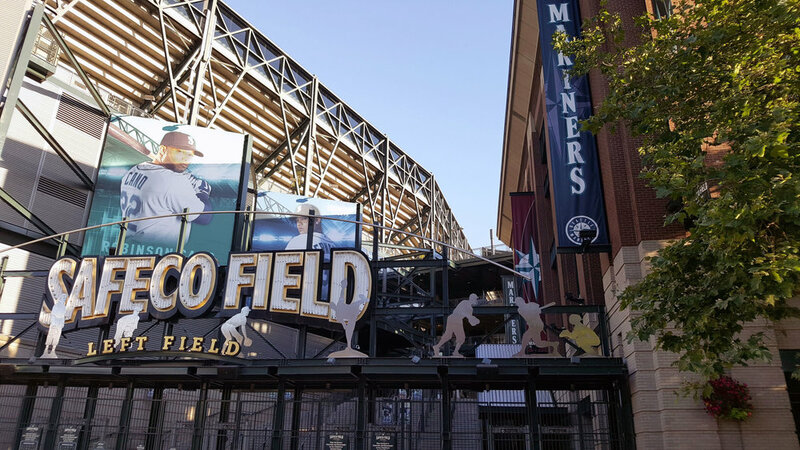 The independent feasibility study prepared for the Safeco Field (now renamed T-Mobile Park) addresses risks and mitigation for the public owner in conjunction with a now executed new 25-year lease in conjunction with major planned capital improvements. Mariners Lease for T-Mobile Park: The 47,000 seat Safeco Field ballpark was constructed by the Washington State MLB Stadium Public Facilties District from 1997-99 at a cost of $517 million – with funding from general obligation bonds issued by King County and capital contributions from the Mariners Club. The Mariners initial 20-year lease for the stadium expired at the end of 2018 and was proposed to be replaced by a new lease consistent with a Lease Renewal Term Sheet reached in May 2018. As with the initial lease, the Club would be responsible for 100 percent of ballpark operations and maintenance (O&M) and all capital improvements (CapEx) work – to an applicable standard to be set at the top one-third of all MLB ballparks. Provisions of the new agreement are also intended to provide a source of funding for an estimated $565 million in ballpark and related capital improvements over the next 25 years. An independent feasibility review by E. D. Hovee identified several potential risk factors to the public facilities district (as ballpark owner) – related to potential variability of King County funding resources, prospective future Club default or termination, market/competitive factors, and risk of becoming a stranded asset if MLB use were to be precluded over an extended period. These risk factors were all addressed with final agreements in place by year-end 2018. Of perhaps greatest significance, the district and the Mariners Club reached a non-relocation agreement that included a schedule of liquidated damages to be paid by the team in the event of future default on the new lease agreement. Liquidated damages start at close to $505 million, declining each year over the lease term to a figure of $200 million from the 18th to 25th year of the lease. This provision provides greater financial protection to the district in the event of any currently unforeseen event that, if not addressed, could run the risk of the ballpark being vacated by the team in the future and, in effect, becoming a stranded asset. For the private developer or facility operator, the benefits of 3rd party review may not be quite as readily apparent – but no less significant. The major benefit is that all parties know they are entering into a transaction with eyes wide open. Potential problems can be better avoided if identified in advance – saving both taxpayers and investors the public embarrassment if not the financial pain of a deal gone awry. For Portland’s Pearl District, the greatest risk was that the market would not be attracted to urban living. By bolstering the public commitment, the development proved to be a home run – enabling both public and private investments to further up the ante for one of the finest urban neighborhoods in America. For Portland’s South Waterfront, the risk was that the market would not step up to the increased prices required for high-rise residential development feasibility. The market did step-up. Then hiccupped – but recovered by switching from condos to apartments in the aftermath of the Great Recession. With the Washington State Convention Center’s expansion, the greatest risk going forward relates to the sustained financial capacity to make good on debt repayment — even in the event of a future replay of the Great Recession. And the answer is – it would take an economic event more severe and longer lasting to jeopardize the facility’s financial viability going forward. And for the Seattle Mariners and T-Mobile Field, the #1 risk of concern was the potential (not matter how small) that an MLB team might leave the City before the termination of the new 25-year lease – and before repayment of facility improvements. That concern is largely addressed by the agreement for liquidated damages in the event of future default – a provision added to the initially agreed lease terms. No transaction can address every potentially conceivable event that may or may not occur in the future. However, good deals are those that cover the types of adverse events that have happened before and might reasonably be expected to occur again. Understanding the risks and the solutions in advance lets everyone sleep easier at night. And offers the best prospect for a win-win that withstands the test of time.